Hey! 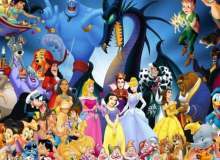 This quiz is Disney and Disney Pixar based, so that includes things like the Little Mermaid, Tangled, Up, Monster's Inc, and so, so many more! Good luck, and do your best! For this quiz, remember to read the answers. Some could throw you off. Once you've read the question, read all the answers, and decide what you think the best answer is. Good luck, and don't stress! Remember, It's only for fun! Which Dwarf in Snow White didn't talk? When did the first Cinderella come out? Which of Nemo's fins were bad? What was Simba's father's name? Which 2 mice helped Cinderella the most? How long was Rapunzel's hair? What was the bear's name in the Jungle Book? Why didn't Jasmine want to tell her father about Aladin? Why did Merida's mother in Brave turn into a bear? What did Sully name the child who followed him out the door? What was the dog's name in Up? Who was Wall-E in love with? At the end of 101 Dalmatians, how many puppies did Pongo Perdita have? How many siblings did Ariel have? What kind of animal is Goofy? In the original Little Mermaid movie, how many outfits did Ariel have? What was Boo's real name in Monster's Inc.? How did Ariel's mother die? Which was NOT one of Aladdin's 3 wishes from the Genie? You can find more quizzes like this one in our Family Quiz category.